Hope you are having an amazing Sunday ! Mine is going pretty slow, just chilling and being a couch potato. 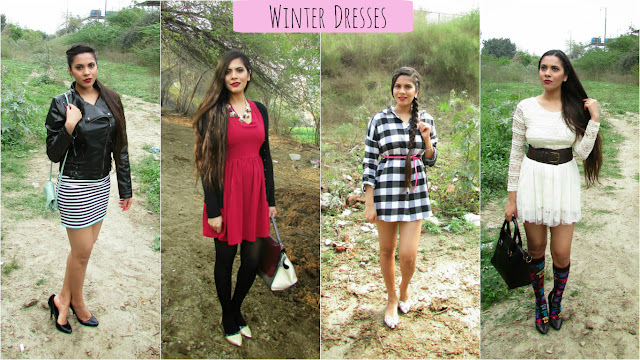 So I though its perfect time for some throwback on winter dresses and how I was styling different dresses like lace , strip , bodycon and others for winter months. So this is my favorite outfit for the time when its not too cold, not too how, so I named it Unofficial Spring outfit. It is cute , simple ans fun. I love the girly dresses paired with a simple cardi. For some reason I am totally feeling leather material these days, best part id , its still very much in trend. For this Rocker Chic Vibe, I paired my beloved leather jacket with a strip dress. I love me some black and white, and when its check , its even better. This little shirt dress from post Rainy day outfit looks adorable both with or without stockings. 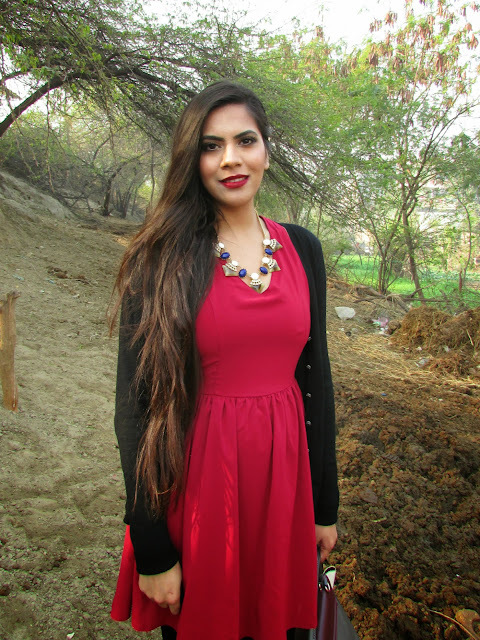 SO this was the second part of my Winter Dresses Series, do Check out the first one Winter Dresses-Strips Lace Vintage. And also let me know , are you a dresses addict like me ! Do you also love to wear your lace dresses, strip dresses and other styles in cold months too ! Love all the looks!! You look so nice in all of them!! Nice outfits :) Happy Sunday! Love the red dress <3 You look beautiful!!! Oh Pooja these are some stunning looks. I'm in love with the check look. I seriously wished that winter/spring could be as warm. Thanks for your lovely comment on my blog. Love the first two looks! Red is a fab color on you and there is just something about a leather jacket paired with a simple skirt. WOW...u look stunning...want the striped skirt. Stylish alright but these outfits if I wear for winter, I would have drop dead freezing.